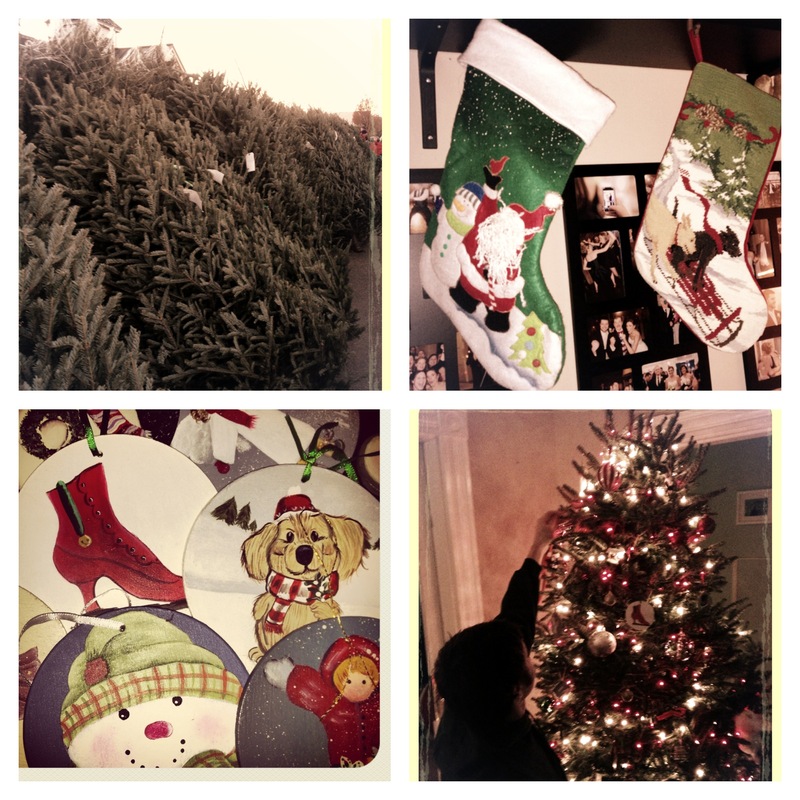 And now Christmas is in full effect at the Schoon house! But still, I was itching to make good use of our leftovers, especially the stuffing. I don’t know about all of you, but for me Thanksgiving isn’t about the turkey or the pies – it’s about the stuffing. I.love.stuffing. I could eat it for days (and did). And I feel as though it never tastes as good at any other time of year than it does on Thanksgiving. This year, I made the standard and also a Cornbread Bacon stuffing from Martha Stewart that was so delicious! We had so much of it leftover, I did all kinds of googling to see what I could do with it. But I wasn’t finding anything that I thought sounded good. Then for some reason, meatballs popped into my head, not really sure why. But I thought “Why not take the stuffing as the ‘meat’ you’d use in a meatball, and prepare a ‘stuffing’ ball in a similar fashion?”. So I pulled up the recipe for Paula’s Crockpot Meatballs, made a few adjustments, gave it a shot, and most times when I go at things in this fashion, there’s always something that goes awry, but not this time! 2) Combine egg, breadcrumbs, parmesan cheese and garlic powder in a small mixing bowl to form a paste. 3) Add the leftover stuffing to the paste, mixing with a spatula (or just your hands) until it becomes a dough like consistency. 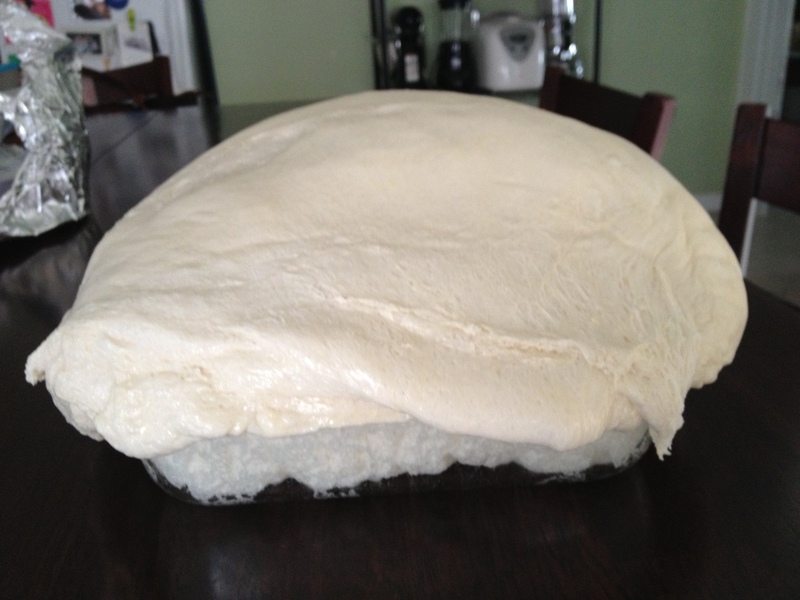 4) Take 2 tbsp of the stuffing dough (for larger sized balls – 1 tbsp. for bite sized) and roll between the palms of your hands to form a ball. 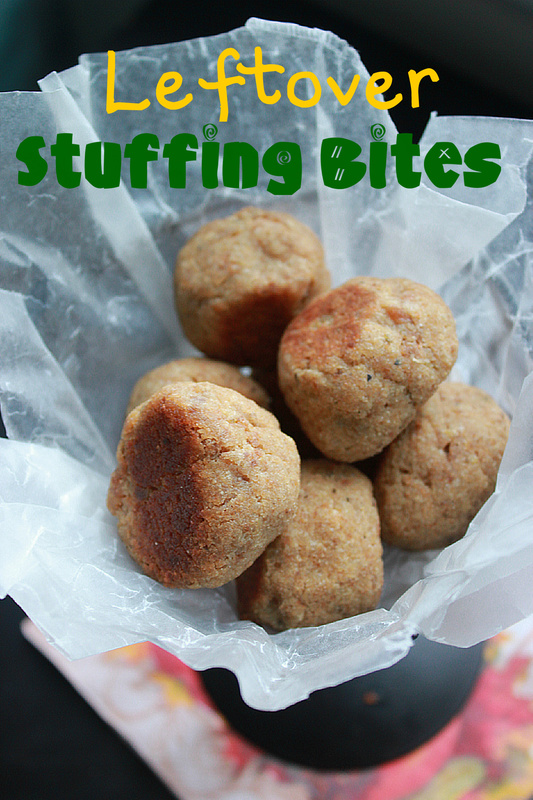 Place stuffing balls on a baking sheet coated with non-stick cooking spray. 5) Bake in preheated oven for 10 minutes – flip over and then cooking for another 10 minutes on the other side (20 minutes total). 6) Mix honey mustard and mayo together in a small mixing bowl and serve with stuffing balls as a dipping sauce. I asked Dave to try one, and he said “It tastes like stuffing” (deep thoughts). Which it did – but it has a nice moist texture, similar to that of a meatball, with the same great flavor that everyone loves about stuffing. It’s a great way to re-purpose your leftovers, or if you don’t have the stuffing leftover, you could whip up a quick Pepperidge Farm batch and serve these as an appetizer at your holiday parties. And people will say “Hey, these taste like stuffing! YUM!” – GENIUS! Feel free to adjust the spices/seasoning if you wish – I wanted to go light on that aspect of it, only because the stuffing itself already has so much flavor that you don’t need to add a whole lot to it. 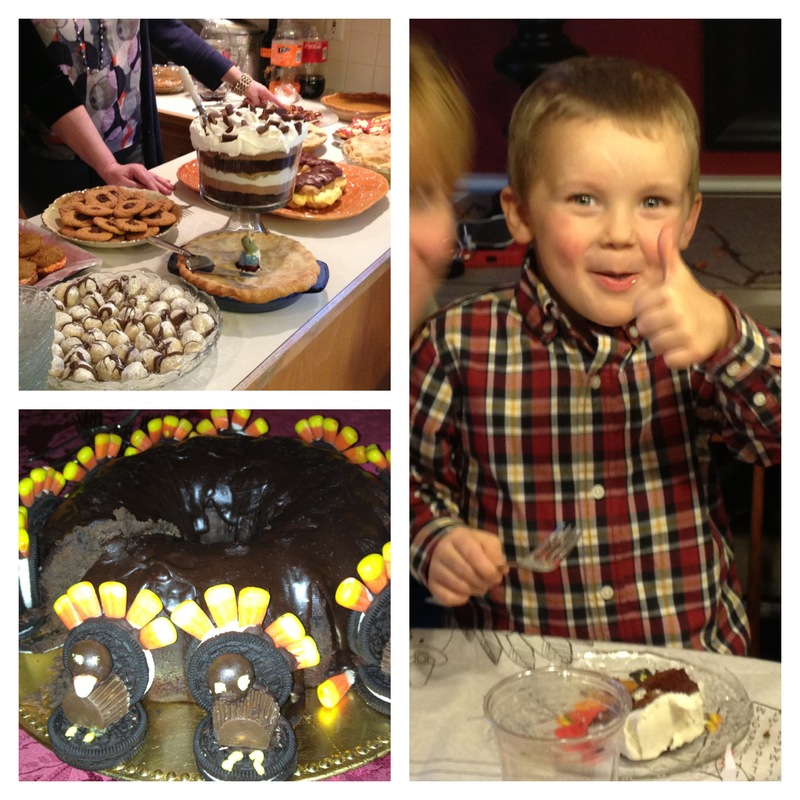 Well folks, that’s my last T-day recipe for ya – next will be ALL Christmas – ALL the time – get excited – I know I am! *Many apologies for the less than appetizing picture – I was preoccupied with skipping through the house putting up Christmas Decorations when I realized I needed to snap a pic of these yummies before it got dark at 4pm – damn you natural light! They taste MUCH better than they look in the pic, swear! A few years back, Dave and I attended a holiday dinner party at his former bosses house, and his wife did a bang up job with dinner! I remember sitting down to the table with bug eyes at how amazingly delicious everything looked – except for this one orangey looking thing, covered with nuts. I started to sweat, because it’s really in poor taste to not try everything at a dinner party, so I scooped a little teeny smidgen of it, and went at it with my fork in one hand and my glass of wine in the other, just in case I needed an emergency wash down. I took my first teeny little bite, small enough that I could taste what I was eating but not so much so that if I was about to gag it would be totally obvious – and thought “oooh, mmmm….this is pretty good actually.” My next bite was bigger, and after only a couple bites my small little scoop was gone – but I wanted more! So I took seconds….thought about thirds but didn’t want to embarrass Dave in front of his co-workers by stuffing my face. I knew I had to have the recipe and finally, she emailed the recipe to Dave and he forwarded it to me, and since then, it’s become a staple at Thanksgiving and Christmas, like the mashed potatoes or green bean casserole. It’s a light and fluffy combination of pureed carrots and lots of other ingredients that are better not to know – but luckily for you, I’m gonna share them, right now! 1)Preheat oven to 350 degrees. Prepare your baking dish by greasing the bottom and sides with butter or non-stick cooking spray. 2) Cook the carrots in boiling water until fully cooked through. Puree them with an electric mixer or food processor and allow to cool completely. In the mean time while they’re cooling, you can prepare the topping by pulsing the corn flakes in a food processor (or just crushing with your hands in a ziplock), then adding them to the brown sugar, melted butter and pecans. 3) Once the carrots are completely cooled off (the eggs will cook when you add them to the carrots if they haven’t cooled enough), add all of the other ingredients and blend with a mixer until fully combined. 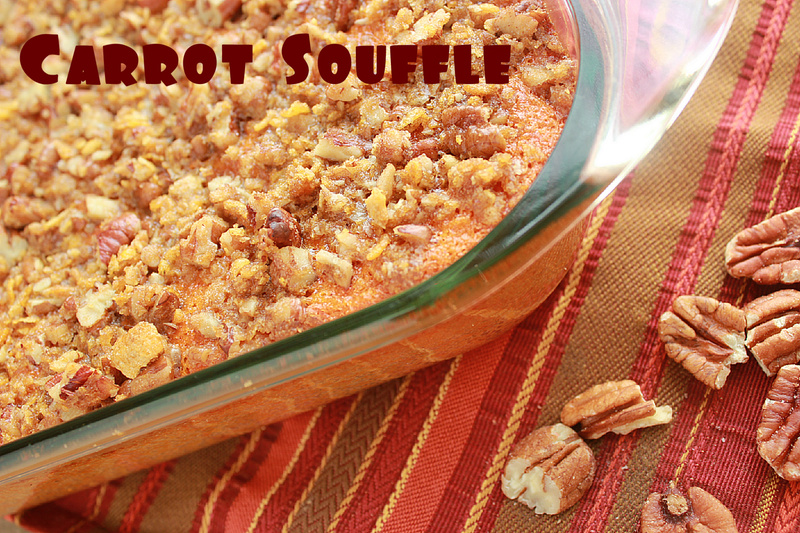 4) Pour carrot mixture into the dish and then top with cornflake/pecan topping. Feel free to make more of the topping if you’d like – it is quite delicious! 5) Bake souffle in preheated oven for 1 hour. This Carrot Souffle is a sweet treat for your tastebuds to take bites of in between the turkey and stuffing and mashed potatoes and green bean casserole and…. One week from tomorrow, we’ll be hours away from the biggest eating holiday of the year: THANKSGIVING! And this weekend, Dave and I will be hosting Dave’s High School clan for a ‘practice’ T-day dinner – because let’s be honest, this is the only month where that extra 5-10 lbs can be solely blamed on the fact that there is one day in the month where your caloric intake for the day might be what your monthly caloric intake should be. But hey – that’s what sweatpants are for! So LET’S EAT! Besides the turkey, the stuffing, the mashed potatoes, the squash, cornbread, green bean casserole, apple, pumpkin and pecan pie (tissue – wipe drool – continue typing) the next most important thing is the table you serve it on. Have some fun with it – it only comes once a year afterall! Start with your base – decide on either a table cloth or runner to lay on your table. I chose a solid white runner vs. one with a pattern, only so that the items on the table wouldn’t clash but there are a lot of really fun cloths and runners out there, with patterns and solid as well! Or hit up a fabric store and get a piece of cloth or burlap and make it a DIY base for your table. Placesettings – whether it’s a small dinner for 2, or if you’re like my family, a cluster bomb of a dinner for 25, you can really get creative with your place settings. 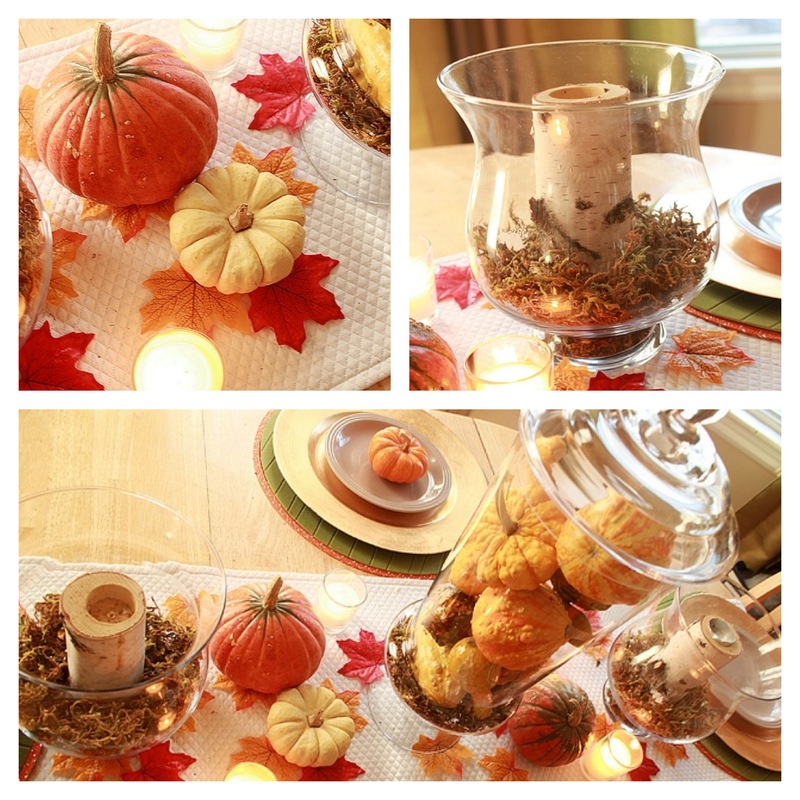 Try layering, with a few different placemats that are different shapes and colors. As you can see below, I used 2 different round placemats, one orange, one green, but varying in size just enough so that they would create a layered look. 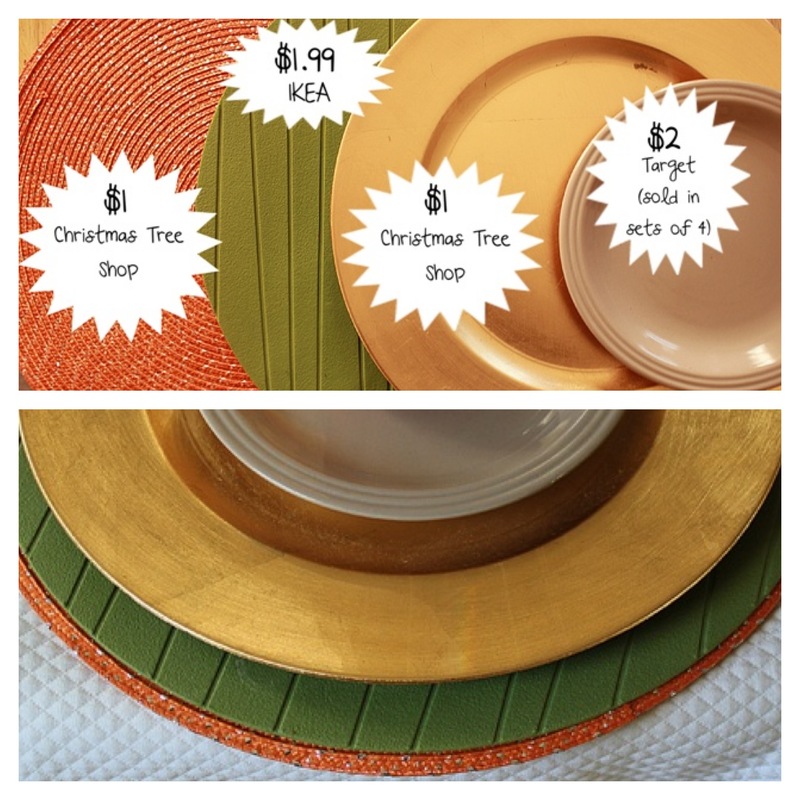 Topped with a gold charger and beige salad plate (all super cheap!). 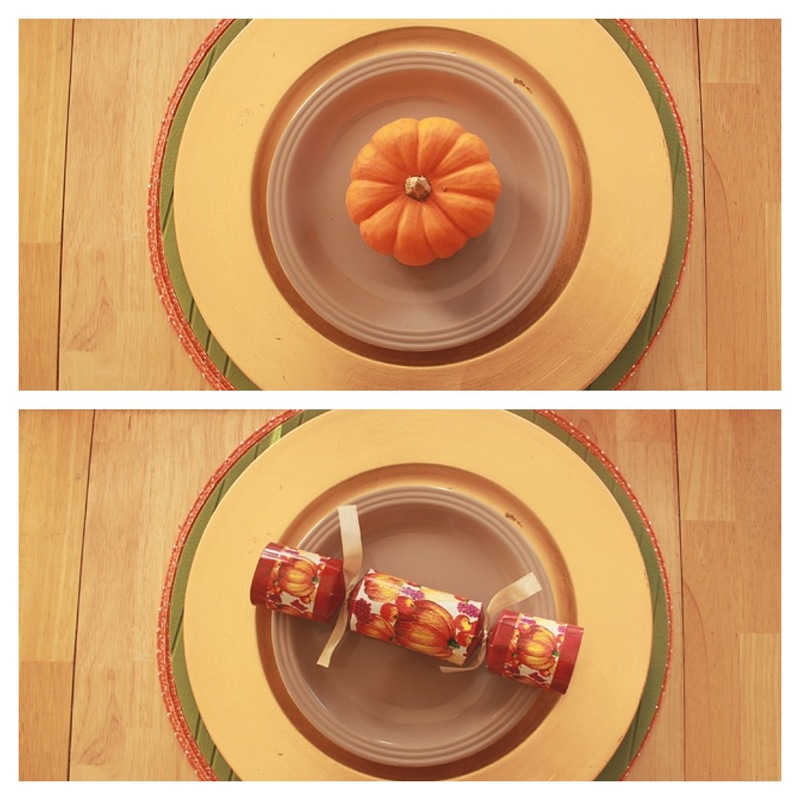 You can then choose a fun topper for the plate, whether it’s a cute little pumpkin, a cloth napkin with a creative napkin ring around it, or those fun paper poppers with prizes inside! I found them at the Christmas Tree Shop for $3.99 for 6, and they provide hours of endless entertainment (especially after a couple cocktails!). Another option is a personalized place card for each person, if you do assigned seating. 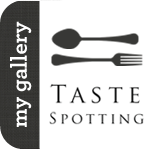 This is your chance to show your style – with your table ‘flair’. Honestly, there are soooo many fantastic ideas out there, it’s almost overwhelming. But the best part of fitting your table with it’s flair is that you can keep it simple, or get a little cray cray – anything goes. And, you don’t have to spend a lot of money doing it! 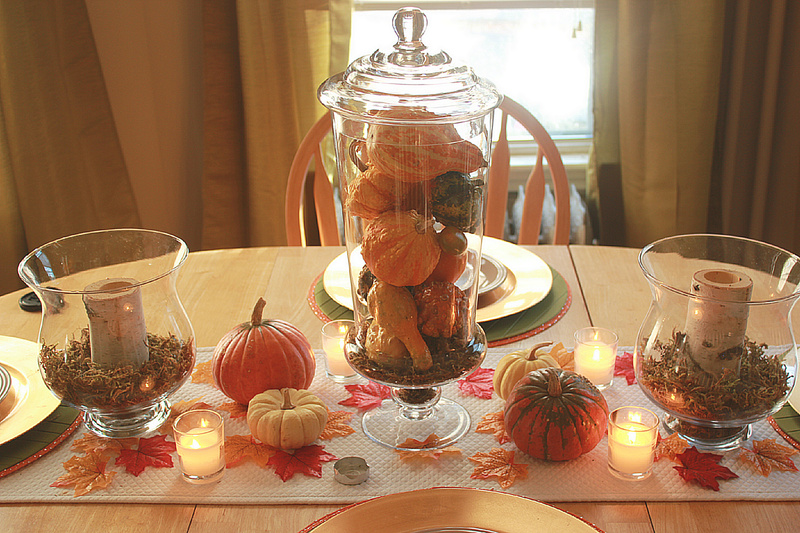 I think a main focal point to have in the center of your table is key, and that can include a wide range of things, whether it’s a special Thanksgiving flower arrangement you got from distant relatives, or a Turkey that your kids made in Art class with construction paper. It’s the first thing people will look at when they see your table, so get creative and enjoy the ‘oooh & ahhhh’ factor! Myself, I am OBSESSED with those big candy jars that are popping up everywhere. The main place I’ve been seeing them lately is on the Food Network, and they’re usually filled with delicious candies or fruits. I found this one at Home Goods, on clearance marked down to $8 from $40, but you can find these essentially anywhere (Target, Marshalls, any place that has a home goods department will surely have these!) And I decided to fill the bottom with some faux grass I got at the dollar store (for, you guessed it, $1) and then a variety of gords and pumpkins to add some color poppage that would compliment the colors of the place settings. Then compliment that focal point with other smaller/shorter items. I used two other smaller sized hurricane lamps that we had and again, filled the bottom with fake grass and then placed two birch pillar candles from our wedding (purchased on Etsy) but really any pillar candle will do, and those you can typically find pretty cheap as well. Then in between the two hurricane lamps, I filled the space with smaller sized pumpkins and more short candles, sprinkling the white runner with faux leaves purchased at the dollar store (I should buy stock in this joint) to break up the whiteness and add some color. You could also use a vine with berries on it (bittersweet always looks really nice with the reds and yellows). Candles are great too because they’re cheap and come in all different sizes and heights and really push the ambiance to the next level. 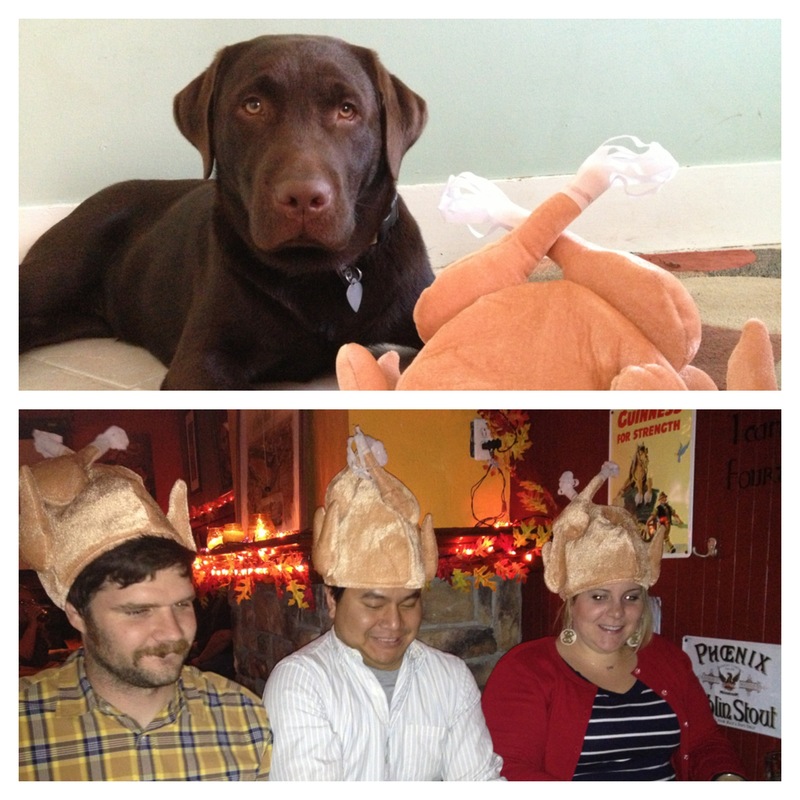 So there you have it folks – hopefully this will inspire you to get your T-day flair on! You still have a whole week to collect your items and lay them out perfectly before everyone arrives next Thursday. 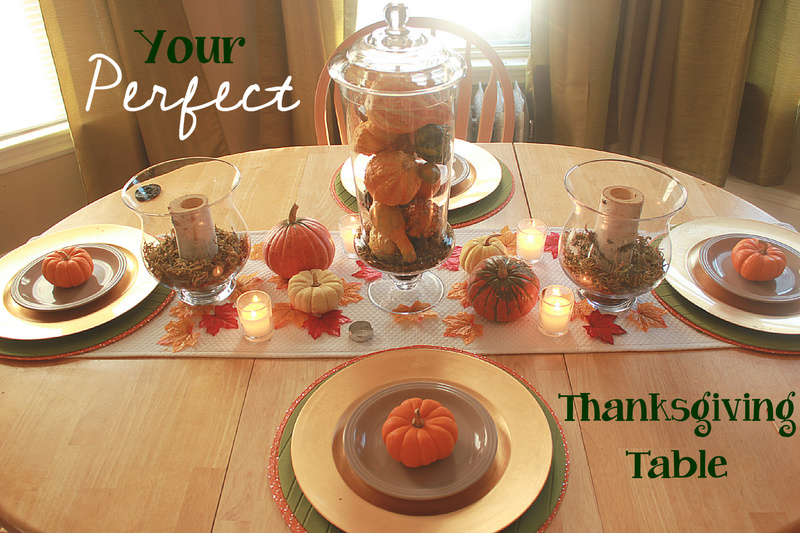 And I’m sure when everyone arrives on Saturday and is ready to hunker down for Thanksgiving dinner…..
Ah well, in theory, a beautiful Thanksgiving table setting is a great idea! I’m not afraid to admit when perfectly laid out recipes go astray. 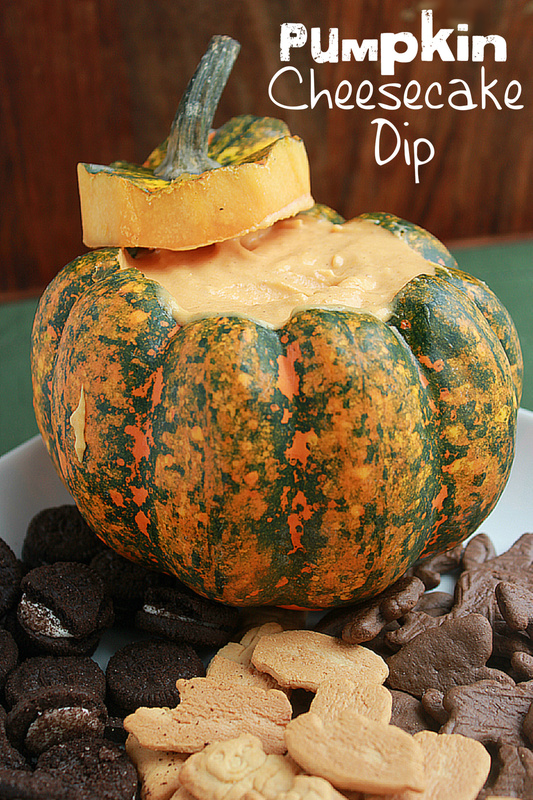 Last Thanksgiving, we had some friends over for a makeshift ‘Thanksgiving Dinner” and our friend Alissa brought this pumpkin dip with various treats to dip in it, and OMG – it was beyond good. And the best part was that it was served in a hollowed out pumpkin! Major points for presentation! So this past Sunday, Dave, Hairy and I had plans to meet up with my cousin Catherine and Buddy and my Aunt Jane at Buddy’s fab apt. in the north end (recess lighting and all). Pizza from the ORIGINAL Pizzeria Regina, which is right around the corner from his apartment (I swear I’d be well over 300 lbs if I lived there) was on the menu, so I decided I was going to make this pumpkin dip as a nice ‘lighter’ option for dessert. I literally stood over the bowl with the electric mixer for a good 10 minutes, just waiting for all these little lumps of cream cheese to disintegrate. But it didn’t happen. And while it tasted pretty good, I am a firm believer that you taste with your eyes just as much as your mouth, and the sight of this mess of a dip even made me, someone who never passes on dessert, want to say “Ahhh ya know what? I am just SO full I think I’ll pass on dessert!” I was so ashamed of it, I frustratedly tossed it in the dumpster outside of Buddy’s apartment as we were walking to our car – $1 leaf bowl from Target and all. But I was determined to make this better somehow. So I tried it again last night, using essentially the same recipe, but using a different process to combine them together, and BINGO!!!! We have a winner! 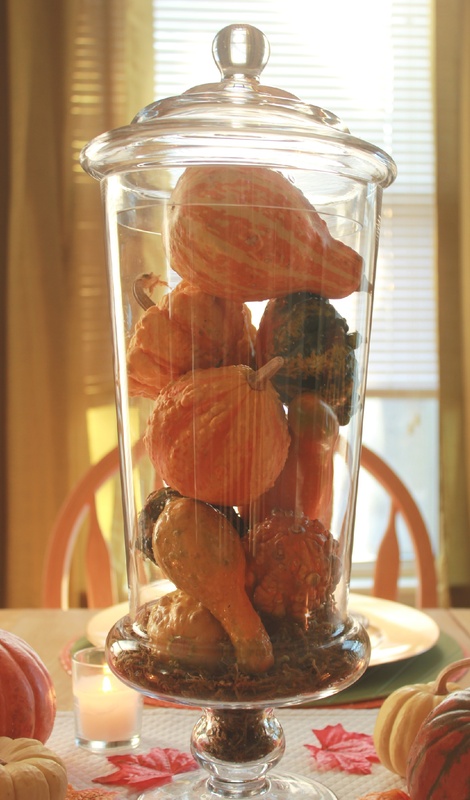 *makes about 1.5 cups – perfect amount for a small pumpkin! 1) In a large mixing bowl, combine the cream cheese and pumpkin puree with an electric mixer on low until both are fully combined and smooth. 2) Gradually add the powdered sugar to the pumpkin/cream cheese mixture (I did about 1/3 at a time) mixing well in between. 3) Add the pumpkin pie spice and mix well until all ingredients are combined and smooth. 4) Chill in the refrigerator for at least an hour (up to overnight). Serve with whatever you see fit to dip! Personally I think that chocolate goes really nice with this, so I used chocolate animal crackers, graham crackers and bite sized oreos, but the options are endless! So what was the difference between the two? In version 1, the directions said to mix the softened cream cheese and the powdered sugar together until smooth – without sifting the sugar first, causing big sugary lumps of cream cheese to form before the pumpkin even went into the mixture. After that, there was no going back, no matter how much you mixed. The second version though, I mixed the pumpkin and cream cheese together first, until smooth, and then gradually add the sifted confectioners sugar, which honestly makes perfect sense now that I look back, but at the time I just followed the instructions without giving it any thought. Finally, after 2 tries, it was what I had always envisioned it being – a deliciously smooth combination of pumpkin and cream cheese that’s fun to eat and ridiculously easy to make. 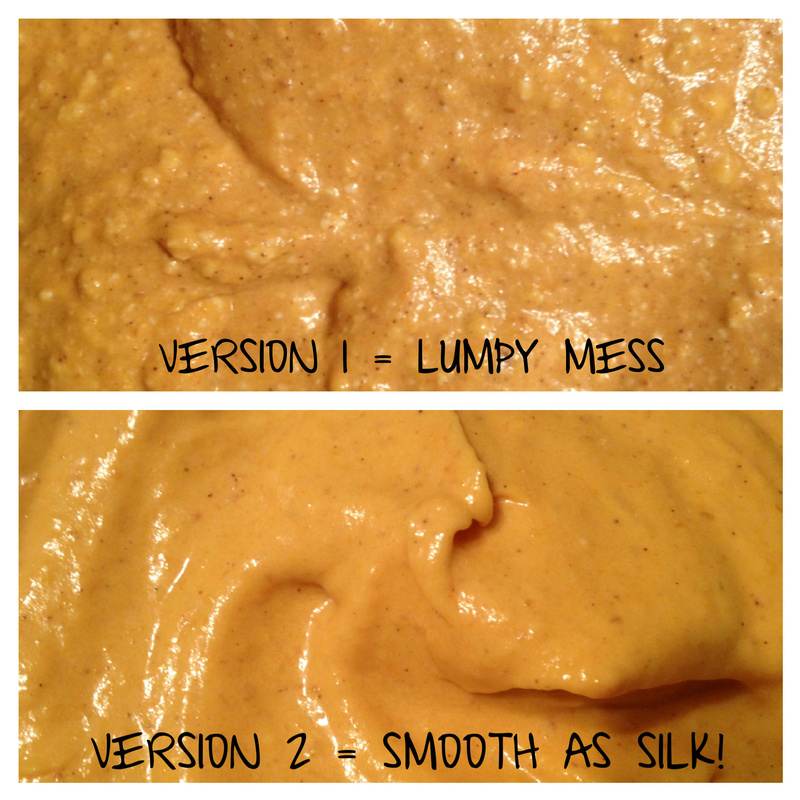 Feel free to tweak the measurements of pumpkin too, adding more or less depending on your pumpkin tastes. And, putting it in a cute hollowed out little pumpkin = genius. Perfect for a pre-dinner dessert for people to graze on, or a nice, lighter alternative for people after the big meal is over, as you can dip as much or as little as you like – it’s commitment free! Happy Friday everyone! Man, these 5-day weeks are BRUTAL! To say that the weather around here has been crazy lately would be a complete understatement. Within about a week and a half, we had a Hurrricane AND a Nor’ Easter that brought the first snow of the season to Boston – and now it’s all melted and it’s supposed to be 70 degrees on Monday. Wuddup mother nature? I only have so much room in my closet to be prepared for all these weather scenarios! Anyway, Thanksgiving is rapidly approaching in just two weeks! And this recipe for Pumpkin Ice Cream Pie is a special one as it’s a Schoon Family ‘Dessert Heirloom’ of sorts. Dave’s Mom and Grandmother make it every Thanksgiving and it’s really a nice change to your run-of-the-mill Apple and Pecan pie. After hours of grazing and face stuffing on Thanksgiving Day, when you think you can’t fit another morsel of food in your already overstretched stomach, out comes the Pumpkin Ice Cream Pie. And suddenly, ah ha! Whaddaya know, I found room for a sliver! *Yields 1 – 9″ pie – however, there is probably enough ice cream to make 2 pies, so if you double the graham cracker crust, butter and sugar measurements, you’d have enough crust for 2 pies. 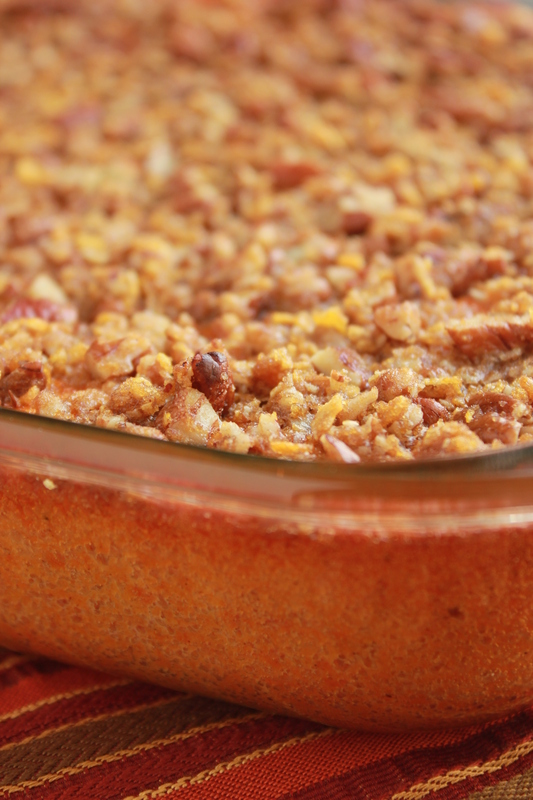 2) To prepare crust, combine graham cracker crumbs, sugar and butter in a mixing bowl. Coat 9″ pie plate with non-stick cooking spray and then press the mixture firmly into the bottom and up the sides of the the plate. 2) Bake crust in preheated oven for 10 minutes or until edges are golden brown. You’ll notice that the crust will puff up a little bit while baking – simply take your hands or a rubber spatula to push it back down into the pie plate. Cool on rack before filling. 3) To prepare the pumpkin filling, combine ice cream, pumpkin, brown sugar, pumpkin pie spice, and orange juice. 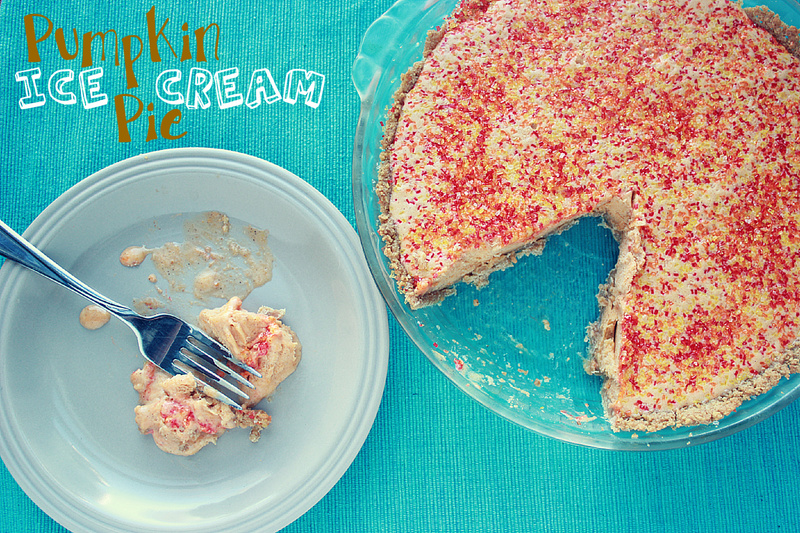 4) After the crust has cooled, pour the pumpkin ice cream filling into the pie plate. As mentioned above, there will be quite a bit of ice-cream filling left over, so feel free to save it or prepare another pie with it. 5) Freeze until ready to serve. Feel free to top with cool whip, or as you can see, I ‘bedazzled’ mine with some fun harvest colored sugar crystals for some texture. I would also recommend letting your pie sit for 5 minutes or so before trying to cut a slice – it just makes it a little easier to take it out of the plate. Happy Friday everyone – happy weekend to all! 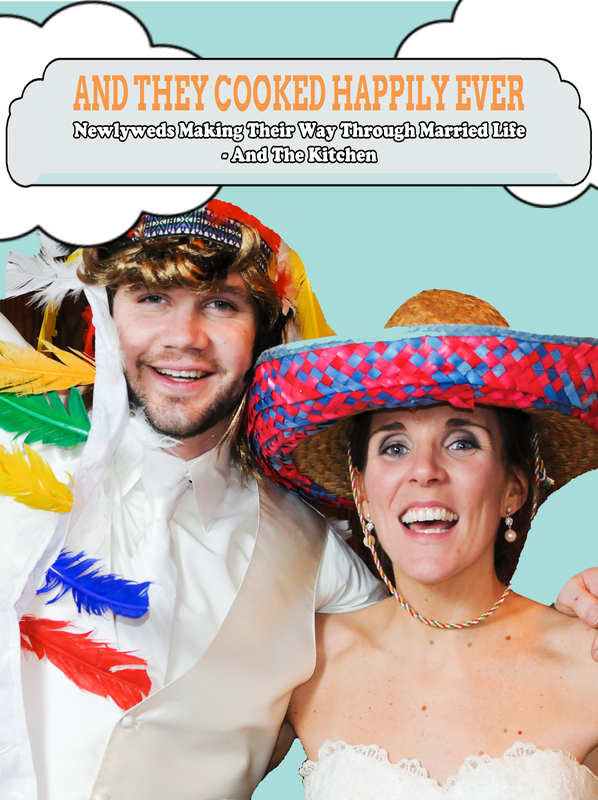 I’m stuffed – wanna know why? I was stressed last night – what a nail biter the election was! And I don’t know about you guys, but I am a stress eater. Instead of knitting, chewing gum or taking a brisk walk when I’m feeling anxious about something, I stuff my face with whatever is in arm’s length of me and not nailed to the table. 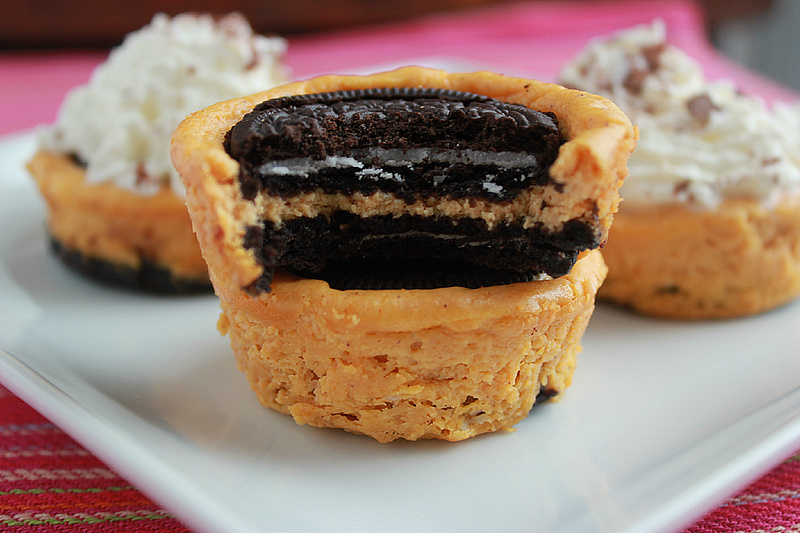 So, all in all, not the best night to make these Pumpkin Oreo Cheesecake bites – we’ll leave it at that. A similar flavor to those Pumpkin Oreo Truffles from a couple months ago, but much more rich and dessert-like. And the best part is there’s no fork needed – you can pick them up with your hands and in 2 (maybe 3 for most normal humans) bites, down the hatch they go! 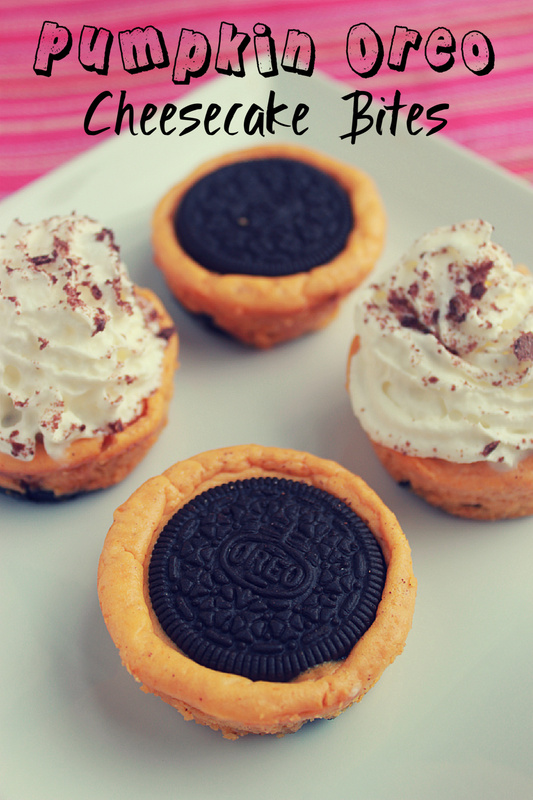 2) Spray a 12-muffin pan with non-stick cooking spray and line the bottoms with 1 Oreo cookie per slot. 3) Beat the cream cheese until creamy. Add the sugar and cream again. Add the eggs one at a time beating after each one. Add the rest of the ingredients and beat again. 4) Fill each muffin tin 3/4 full with the cheesecake batter (on top of the oreo at the bottom), then push another whole Oreo into the top of the batter. 5) Bake for 20-22 minutes. Cool in pan for 15-20 minutes and then take a knife around the edge of each cheesecake to loosen them from the pan. At this point, they should pop out easily. You can then place them on a wire rack to finish cooling. 6) Keep refrigerated. Top with whipped cream and crushed oreos before serving. In the mean time, I’ll be doing 2 hours of cardio tonight to work off last night’s (and um, this mornings?) 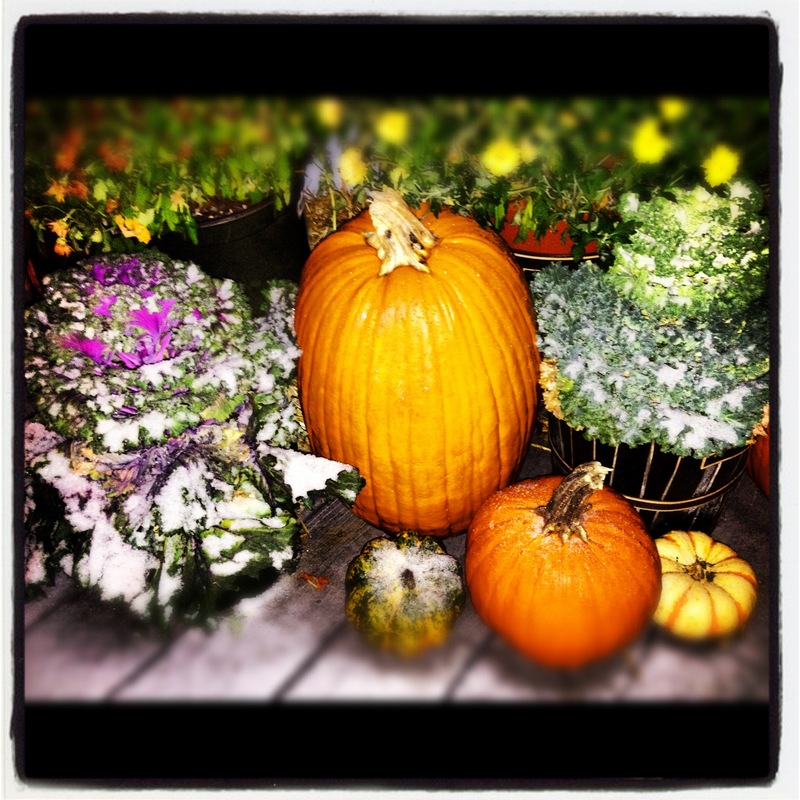 Pumpkin Oreo binge – in the middle of the nor’ easter we’re getting – DOH. You know that saying “Life is what happens when you’re busy making other plans”? Well, same goes for cooking I think -sometimes really good stuff can come from a recipe that you really didn’t plan. Last year, I had pumpkin risotto for the first time, and man was it good! Lord Hobo is a bar in Cambridge, MA that you’d probably walk right by and not give a second thought. But their craft beer selection is beyond amazing, and their dishes are just as unique. So I decided to make this Pumpkin Risotto, in the spirit of fall. Risotto takes a bit of time – all the stirring and adding of the chicken stock – it’s a dish that really needs to be baby sat. So when it’s ready, you can’t WAIT to dig in! Dave and I paired it with Maple Garlic Marinated Pork Tips, which were out of this world. But the risotto just didn’t taste quite as good as I remembered. I strongly believe that thing always taste just a little bit better when you don’t have to make them yourself, but this wasn’t quite the level of delish that I experienced at Lord Hobo. There was a lot left over, and I toiled back and forth as to whether or not I wanted to photograph and blog about it. Because I wasn’t fully supportive of it. But I didn’t want to waste it either, because it did take so much effort to make. Then the invisible lightbulb turned on and shined bright – ARANCINI BALLS! 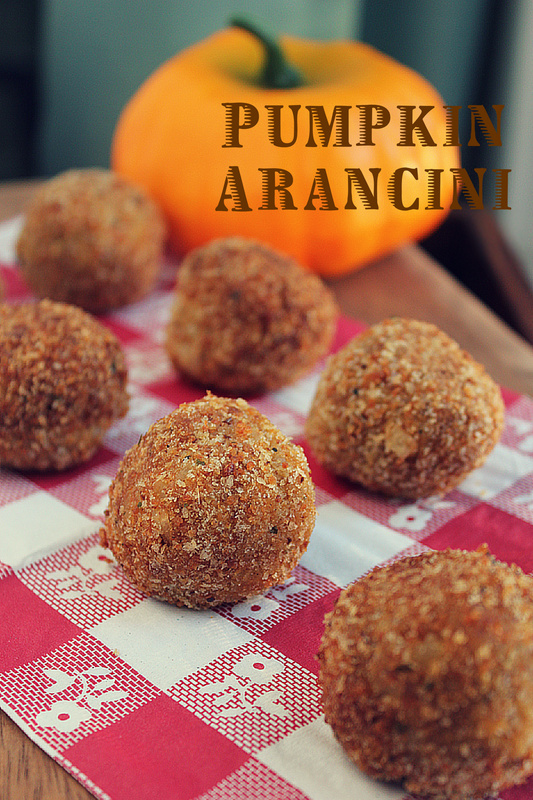 I think the first Arancini Ball I ever ate was a frozen one from Trader Joe’s – and even that was so tasty that I wondered how I had never known about this genius concoction of cheese and risotto, rolled into a ball, and fried. I’ve never made them myself, and have heard from others that they’re a lot of work, but the work was well worth it. 1) Bring stock and 2 cups water to a simmer in a small saucepan and keep at a bare simmer. 2) Cook onion in oil in a 2- to 2 1/2-quart heavy saucepan over moderate heat, stirring occasionally, until softened, about 3 minutes. 4) Remove from heat and stir in pumpkin, cheese, and butter, stirring until butter is melted. Season with salt and pepper. 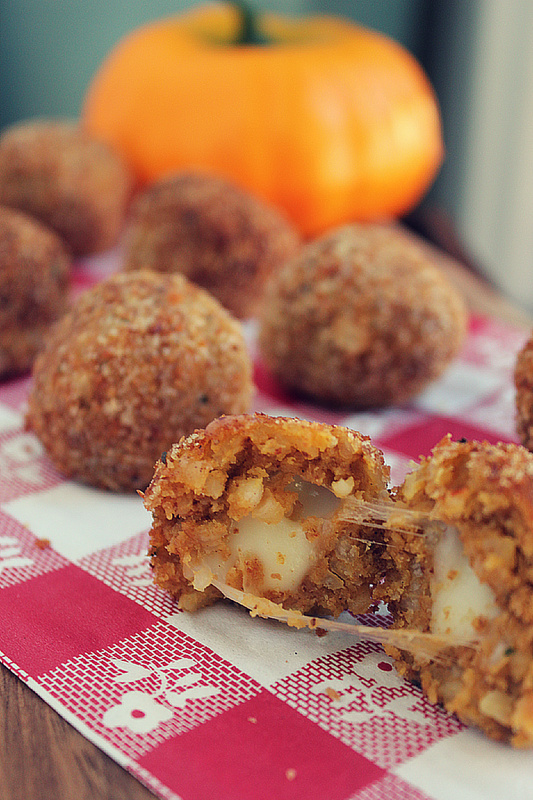 Set aside and be sure to let cool before preparing the arancini balls. 1) Put 1 cup bread crumbs in a shallow dish and set aside. 2) In a medium bowl, combine 2 cups of pumpkin risotto, bread crumbs, parmesan, and eggs. 3) With damp hands, using about 2 tablespoons of the risotto mixture, form the mixture into 1 3/4-inch diameter balls. 4) Make a hole in the center of each ball and insert a piece of the mozzarella in the center, covering the hole to enclose the cheese. 5) Roll the balls in the breading to coat. 6) In a large heavy-bottomed saucepan, pour in enough oil to fill the pan about 1/3 of the way. Heat over medium heat until a deep-frying thermometer inserted in the oil reaches 350 degrees F. (about 5 minutes). 7) In batches, fry the risotto balls, turning occasionally, until golden, about 4 to 5 minutes. 8) Drain on paper towels and serve. I know you’re thinking ‘WOW – that’s a LOT of steps and a lot of time!’ But I swear, they’re worth every bite, especially served hot, when the cheese is still all gooey and stretchy. The perfect combination of saltiness and sweetness from the pumpkin. And you could probably experiment with the cheese as well – I just happened to have mozzarella (I am 30 going on 5 and still LOVE string cheese!) but I bet goat cheese or feta would be equally as good. And if you didn’t want a big ball of cheese right in the center, you could use a shredded version to make the cheese distribution more uniform throughout.